This is another crochet hat that I made for the children in my mother’s class she teaches in elementary school to wear during their play. The mother wolf is a character in their play of a mash up of fairy tale characters. 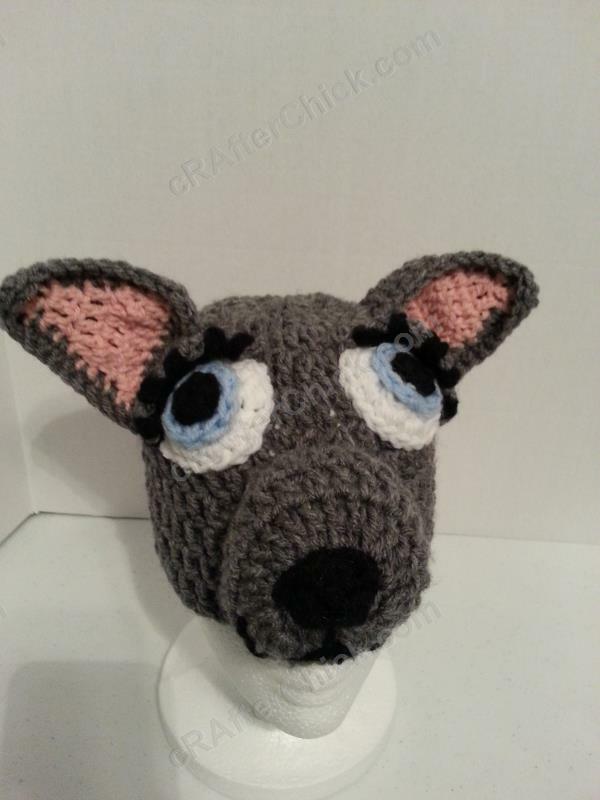 She is the mother to the Baby Wolf, free pattern available here too. I wanted to distinguish her from the Baby Wolf so I gave her sharper looking features like her ears and eyelashes. Give her a try. She’s a lot easier and less complicated than she looks. 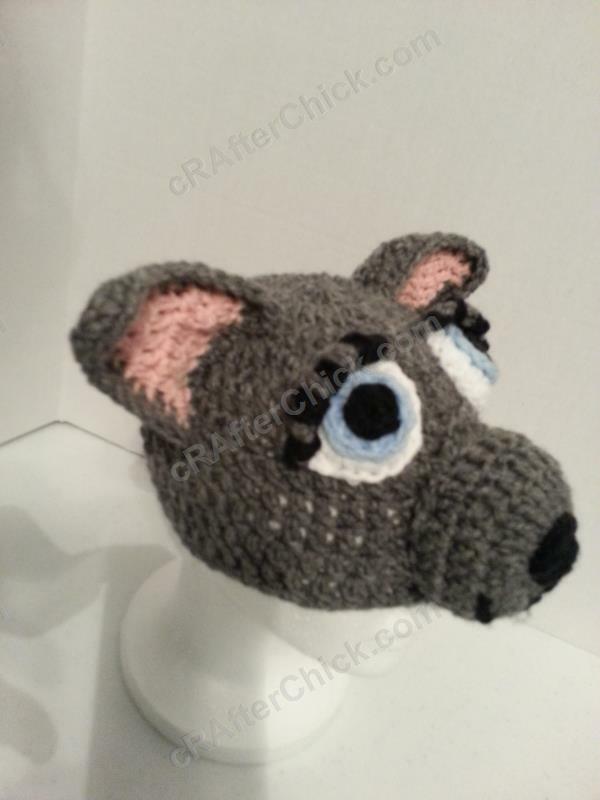 Once you have completed your beanie for the base you are ready to start on making your own mother wolf crochet hat! If you are going to do this in newborn / infant/ up to 1 year old sizes, switch to a G hook for the features instead of the J to scale them down in size. This is an optional step but I do recommend doing this step as it keeps your stuffing in the snout and now falling through the stitches when the hat is worn since they stretch to conform to head. Before cutting yarn make sure you leave a long enough tail to secure the nose back to end of the snout and then attach it to the beanie hat during assembly. Put to side for moment. Leave long enough tail to sew on to the nose/snout front during next steps. Starting with Nose Tip from previous step, use the tail and your yarn needle to secure your nose tip into position on front of the Nose/ Snout. I then used the extra length of the tail to freehand stitch on the mouth lines directly on to the nose front. Once you have done this pull yarn through to inside of snout once fully attached and fasten off. Next line your Nose Back up to the opening of the Nose/ Snout piece. 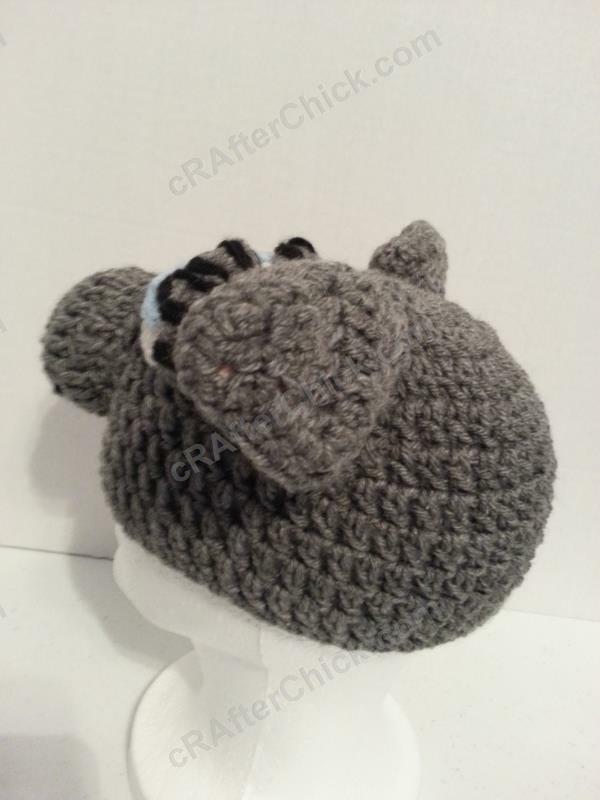 Using your yarn needle and tail from nose/snout, begin sewing the two together to make one complete piece. You want to stop about 1/2 to 2/3 of the way to lightly stuff the snout with some fiberfill stuffing (or chosen filler) to maintain the shape desired. Finish sewing the two pieces together and place to the side leaving remaining tail on piece to secure to hat during finishing off process. Rounds 1-6: Repeat rounds 1-6 of ear front but do not fasten off at end of round 6. Place ear front in front of the ear back. Round 7: Ch 1 before placing 1 sc in each st around the perimeter of the ear working through both ear pieces (front and back) at once. To make more rounded ear like in pictures, place 3 sc in each of the bottom 2 corner and topmost st in ear point. Cut yarn leaving long enough of a yarn tail to sew the ears on to beanie hat during final assembly. Put to side until assembly steps. Cut yarn leaving long enough of a yarn tail to sew pupil on to eye during assembly. Put to side until assembly steps. Round 2: Place 2 dc in 1st st and each of the following 9 st. Sl st in to the top of the 1st st in round. Cut yarn leaving long enough of a yarn tail to sew pupil on to eye during assembly and pull through to back. Put to side until assembly steps. 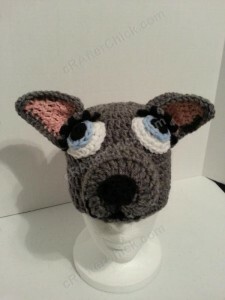 Starting with your eye color, use yarn needle and tail to sew it on to the eye white in the position you desire. You can refer to my pictures to see how I placed mine. Once secure, pull yarn through back and fasten off. Now using the tail from the eye pupil, attach the pupil in front of the eye color attached in previous step. Pull yarn through to back side and fasten off. Round 2: Sc in 2nd st skipping 1st st, 1 hdc in next 2 st, 1 dc in next, 1 hdc in next 2 st, sctog last two st.
Leaving a tail long enough to secure to the eye once eyelashes are attached and cut yarn. For the eyelashes, I just freehand stitched the eyelashes on to the eyelid directly with black yarn and my yarn needle. Just cut a length of yarn and stitch them in as you desire. I just did some thick over exaggerated eyelashes but you can make them thin and more abundant. Whatever you feel like doing to make your mother wolf. Once your eyelashes are in place, pull yarn to back of eyelid and fasten off. Put to side for until ready in assembly. Since I like to start adding my features from the bottom up we will start with the nose/snout pieces of the mother wolf. I find that by working from bottom up you get a better idea of how much space you have during the process. Otherwise you may find yourself scrunching up features at the bottom if you haven’t left enough space in your process. By working upwards you always have extra room as you can just move the next feature up a little higher if need be. 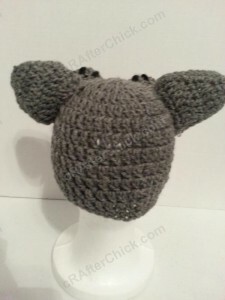 You are now going to use this the tail left on the nose/ snout and your yarn needle to sew it into place on the hat. Once you have secured it into place, bring the yarn into the inside of the beanie hat and finish off. Next we will work on the mother wolf’s eyes. 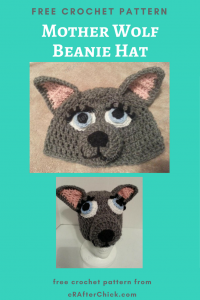 Take the white yarn tail left from one assembled eye and sew it into place on to the hat. Once it’s all sewn on, pull yarn in to the inside of the hat before finishing off. 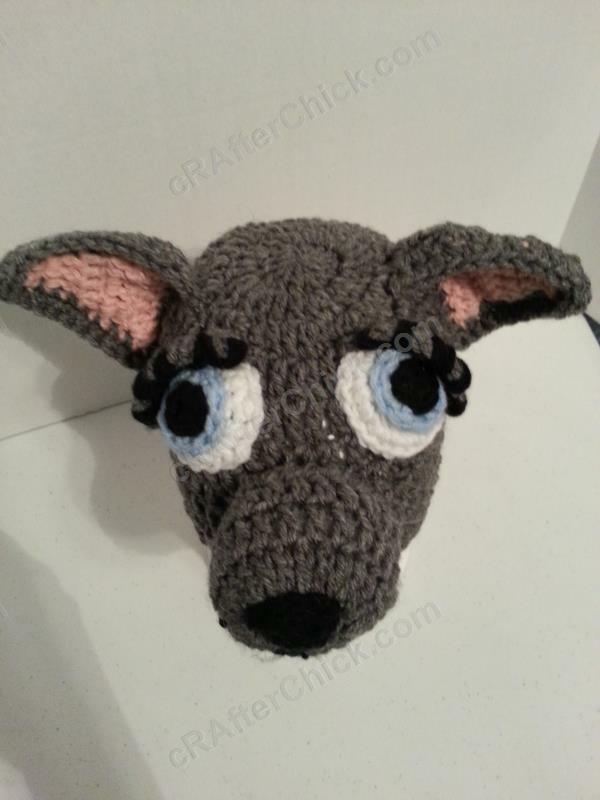 I attached mine in a tighter stitch to give it more of a domed appearance to the eye. You can exaggerate this by adding a pinch of stuffing f desired or just simply sew them on flat. Repeat for second eye. 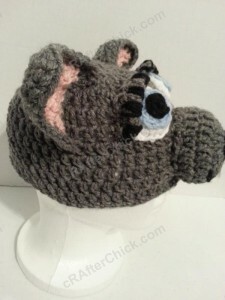 Now take the yarn tail from a finished eyelid and sew it in place on top of eye. Pull yarn through to inside of hat before fastening it off. Repeat for the second eye. 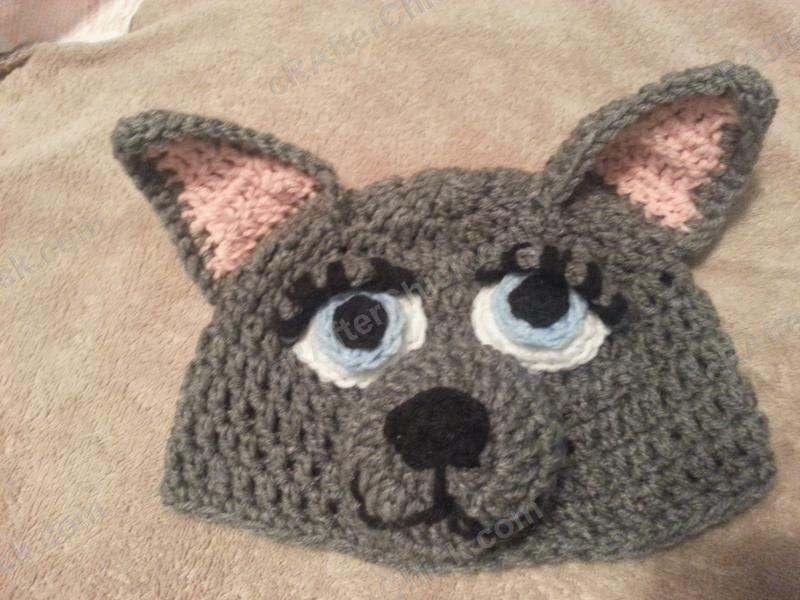 Now all that is left is to attach the mother wolf’s ear on to the beanie hat. Sew each of the ears in place by using the leftover yarn tail from when you crocheted the ears with the pink yarn facing forwards on the hat. Once secure, pull yarn in to inside of your hat before finishing off. Repeat process for second ear. Check for any tails or ends that you may have missed in process to weave in and finish off. Do so if you find any. Then you are all done. One completed Mother Wolf Beanie hat! Enjoy your crocheted creation.